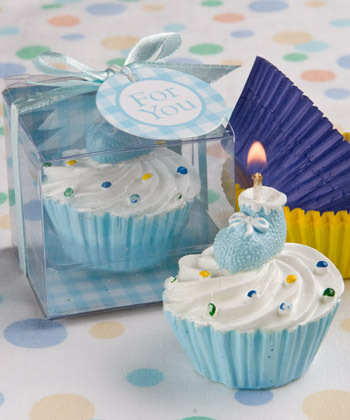 Delightfully topped with a pink baby bootie, this adorable cupcake candle is a scrumptious choice as a favor for a girl’s Christening or baby shower or for any baby girl themed event. And it looks almost good enough to eat! 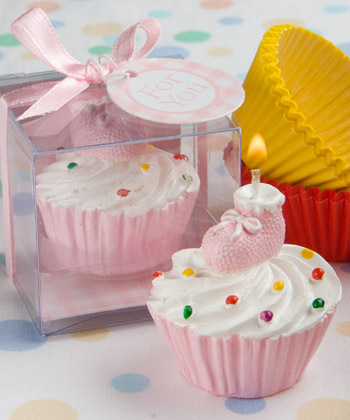 Each baby favor candle measures 1 ½” x 1 ¼” and is made of wax in the shape of a realistic cupcake with a pink wrapper, white frosting, multicolor sprinkles and a knit pink baby bootie sitting like a cherry on top. Sold exclusively by Fashioncraft, each comes in a clear box with a pink and white gingham design background and bottom, wrapped and tied with a baby blue or pink satin bow and an attached matching “For You” tag.